"Pull up your socks" isn't just a phrase to John Cronin. It's been the key to his entrepreneurial success. Back in 2016, the 21-year-old told his dad, Mark, that he wanted them to start a business when he graduated from high school, but he wasn't sure what kind. "My first suggestion was a fun store, but we didn't know what to sell," says John, a native of New York's Long Island. Next he considered a food truck, but there was one problem: "We really can't cook!" jokes Mark. Eventually, they settled on an idea. "John had worn crazy and colourful socks his whole life, so it was something he loved and he suggested we should sell socks," says Mark. "Socks are fun and creative and colourful, and they let me be me," says John, who has Down's syndrome. And with that, John's Crazy Socks was born. A year on, they say they've made $1.4m (£1.03m) in revenue, raised $30,000 for charity, and shipped socks to customers including Canada's Prime Minister Justin Trudeau and former US President, George HW Bush. The online store has around 1,400 different kinds of socks, featuring everything from cats and dogs to barbeques to Donald Trump. Each order is shipped the same day with a pack of sweets and a hand-written 'thank you' note, and John will deliver them himself if you live nearby. 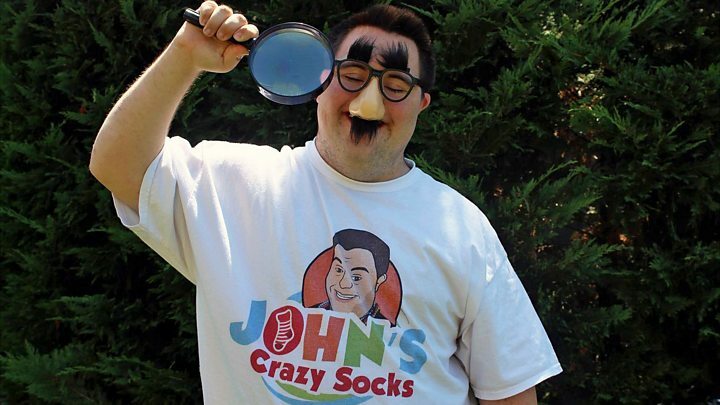 As the face of the business, John also attends trade events, speaks with customers and suppliers, and comes up with initiatives like their "Monday madness mystery bag" and "Sock of the month" club. Mark deals with the technical aspects of running their business. "John really is an inspiration," says Mark, adding that he never gets any special treatment. "He works very hard in this business. We're usually in the office before 9am and frequently don't leave until after eight at night." In just over a year, the pair have shipped over 30,000 orders. They donate 5% of all profits to the Special Olympics, which holds sports events for people with learning disabilities. John competes in the games in sports such as basketball, soccer and hockey. He also designs "awareness socks" to raise money for charities including the National Down Syndrome Society and the Autism Society of America. "We have a social mission and a retail mission, and they're indivisible," says Mark. "I don't think it's enough anymore to just produce a service or produce a product. I think there has to be values attached to that, and we have a model that's showing that." "What we're doing is spreading happiness," adds John. The company wants to get more disabled people into work, and nearly a third of its staff have a disability. "We're working to show what people with disabilities and learning disabilities can do," says Mark. "When I talk to employers I tell them it is absolutely imperative that they hire people with disabilities. "Not because it's the right thing to do, not because they're nice guys, but because everybody is looking for good workers. "This is a vast, untapped pool of great workers." The pair say one of their biggest challenges has been keeping up with demand. In their first month, John's Crazy Socks delivered 452 orders. Three months later this had risen to over 10,000 and they soon had to move into larger premises to cope with the pressure. "We've been a little surprised at how fast it's grown," says Mark. The wider socks market is growing too. Globally it was worth more $42bn in 2016 and is expected to reach more than $75bn by the end of 2025, according to Transparency Marketing Research. "Most of us wear some sort of uniform to work - it might be a suit, it might be khakis and a polo shirt, it might be an orange jumpsuit," says Mark. "Yet you can wear a pair of socks and express yourself, adding some colour and flair, and you can do that for $10 or less." Their sock-success has also been boosted by increasing attention from news outlets and their growing popularity on social media. They've garnered more than 90,000 likes and over a million video views on Facebook. Mark admits it's been a learning curve. He's a Harvard graduate who's spent most of his career in healthcare management and law. "Retail and the sock business is new to me, but we're learning and having fun, and I have the perfect partner," says Mark. "We've been asked, well what do you do when you have a conflict? We really haven't had any. It's been a joyride," he continues. "We've always been very close and always spend a lot of time together. It's a very good partnership because we both share in the mission. We both know we need each other. If this was John's Serious Socks, it's not really going to be working." And what are they most proud of so far? "It makes me happy because I like helping all the customers and I like working with my Dad," says John. "For me it's the model," adds Mark. "It's demonstrating that we can build the company based on giving opportunities - be that giving back or treating people well - and that we can be successful because of that." Mark and John hope to build on their success and turn a profit in their second year. They'll be offering custom socks and opening a wholesale line to sell onto other small businesses. The pair also want to build a studio in their offices for a "John's Crazy Socks Network" to produce more social media content. "Down's syndrome never holds me back," says John.